I found a super neat idea for people who consider themselves "foodies." I just joined a free program that a fellow blogger (The Lean Green Bean) started in 2011 that links two people up each month to exchange packages that they send to each other. The concept is that each person fills a small box with local food goodies and ships it to the person they've been linked up with. In return, you receive a package from them. 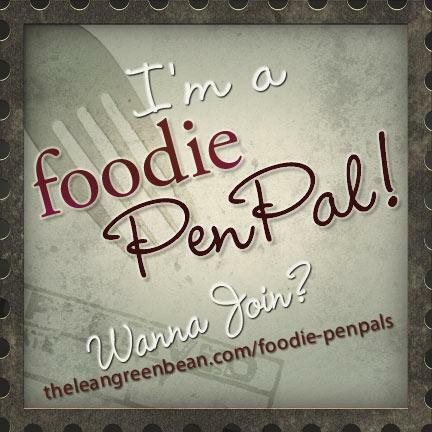 It's called Foodie Pen Pal and it sounds like a lot of fun! Around 1,000 bloggers and blog readers participate each month! Your package can include items like jams, pickles, gourmet cookies, local honey or granola. Once you are given the info for the person you've been linked to, you exchange emails and offer any dietary restrictions or allergy information. This is done around the 5th of the month and you have until the 15th to ship out your package. The box must, also, include something written ... like a note explaining what is in the box or a favorite recipe. I am super excited to try this out! There is a $15 spending limit, so it's pretty feasible. And, won't it be neat to receive something from a fellow foodie from somewhere else across the country! My first month starts in August, so I will be sure to post an update after sending and receiving my package to let you know how everything went!